Continuing our “Getting to Know” series, this month we share an interview with Dr. Gonzalez. 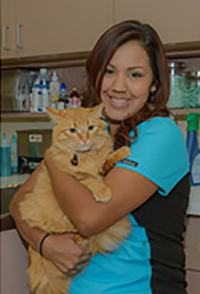 Our objective is for you to know more about each of us, why we’re passionate about pets and how we each developed the skills and experience to help maintain the wellness and health of your pets. Where did you grow up — and what types of pets did you have? I lived in San Jose until I was 7 years old and then moved to Castro Valley. In the following years we moved to Antioch, Brentwood and then back to San Jose. As a young child, my family had a dog and a cat. Our dog had two litters and we kept one of the puppies. Over the years I continued to collect pets whenever I came across an animal I felt needed shelter, food or protection. I brought home cats, dogs, snakes, lizards, fish, a turtle and a crab. Some of the animals I found were taken to animal sanctuaries or re-homed as my Mom wouldn’t allow me to keep them all. Having moved quite a bit, I attended several different schools. I graduated high school from Gunderson High School here in San Jose — Go Grizzlies! I graduated from the University of California, Davis with a degree in Animal Biology. I then graduated from Ross University and completed my clinical year at Colorado State University. When did you know being a veterinarian was your calling? I told my Mom when I was about 6 years old that I wanted to be an “animal doctor.” At the time, and even for years to come, I had no idea what that really meant. Growing up I didn’t know any doctors or veterinarians. I would be the first person in my family to graduate from college, and also to pursue a doctorate. It was a challenging road to face alone, but I learned so much and I now enjoy helping others on their paths through college. I enjoy the relationships between animals and people as well as educating owners about their pets and how to keep them healthy. I also enjoy identifying problems and treating them, whether the solutions are medical, behavioral or surgical. I most enjoy helping people find solutions for their pets when they thought they were out of options — turning situations of uncertainty to ones of hope and resolution. What do you view as the most important practices or activities to keep pets healthy? I find pet nutrition and a healthy body condition to be vital in keeping our pets healthy. A properly balanced diet, consumed at appropriate levels, can make a huge difference in the longevity and quality of life for our pets. Also, keeping pets active and lean may reduce their risk of bone and joint, gastrointestinal, respiratory and cardiac issues. In addition, I find keeping our pets mentally stimulated is essential for long-term health. Pets that are kept stimulated are less likely to exhibit destructive behavior, anxiety, stress or aggression. Pets greatly benefit from a regular routine and daily activity. During your career, what types of animals have you treated? During my clinical year at Colorado, I had the privilege to treat several different species from owls to reptiles to llamas. I also have experience with cows, goats, sheep, horses, birds, fish, turtles, small mammals, cats and dogs. I am most comfortable handling and treating cats, dogs, guinea pigs, rabbits, lizards and turtles. What types of pets do you currently have — and what are their names? I also had two delightful guinea pigs that both passed away last year, Pebbles and BamBam. What are some of your favorite stories about your pets? One of my favorite sounds is hearing my guinea pigs squeak and “popcorn” around their cages when I arrive home. Both of my guinea pigs were rescues that were at the end of their road before we decided to adopt them. They ended up being some of the best pets I’ve ever had. Rowdy, was a stray dog on the island of St. Kitts where I attended the first part of veterinary school. He was hit by a car and I took him in as a foster, but he quickly grew on me. It took some time and effort, but he became a happy indoor dog and he even learned to like cats! Rowdy came with many health issues, including two tick-borne blood diseases, skin disease, fleas, mange, ticks, a torn ACL and much more. After he progressed with treatment, he was diagnosed with heart disease and began treatment. Last year he was diagnosed with cancer and underwent surgery. Through it all, he has been the best dog ever. He never goes a day without giving everyone around him snuggles and kisses. I am happy to say he is now cancer free and his heart condition has been resolved, and my cat Bigfoot is his best friend! Bigfoot, my black and white cat, is the most social and lovable cat I have ever met. I rescued him as a 10 day old kitten that was going to be euthanized because he was sick and his mother left. He has a total of twenty-five toes, and he thoroughly enjoys giving neck and back massages! He likes to jump from the floor straight up onto shoulders, or will wrap his arms around your neck with a big hug. I’ve never known a cat like him, so he is extra special to us. He also LOVES other animals, especially dogs. What hobbies, activities, or interests do you have outside of your calling as a veterinarian? Aside from being a veterinarian, I also really enjoy the behavioral side of working with animals. It can be challenging and time consuming, but the reward is tremendous. I also enjoy photography, drawing and painting, though I don’t have much time for it these days. I hope to start a series of photographs and paintings to document some of my most memorable experiences as a veterinarian. I also love to dance, learn new types of dance, and try new types of food and beer.